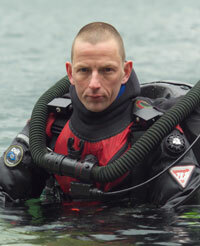 Phil Short started diving in 1990 from a background of dry caving and climbing and at first only completed a PADI open water diver course in order to use SCUBA to pass short flooded sections of dry caves in Mendip and South Wales. He then continued his open water training through the PADI system with Course Director Steve Axtell and in 1991 he qualified as a PADI instructor and began teaching full time, working his way up to Master Instructor. During this period Phil began developing his Technical Diving skills through training with Kevin Gurr and in 1993 was involved in forming one of the first Trimix wreck diving teams in the UK. Over the years, Phil has been involved in film projects for ITV, BBC and Channel 4 on the M1 submarine, the shipwrecks from the battle of Jutland and cave diving projects in Northern Spain ‘The Road to Certain Death’ and the UK ‘Secret Underground’ and the BBC series ‘Oceans’. He has also taken part as a closed circuit rebreather diver in several shipwreck search projects in the Western Pacific and the Gulf of Mexico. Phil has been diving professionally for 19 years and has logged over 5000 dives in caves and open water using both open and closed circuit equipment.